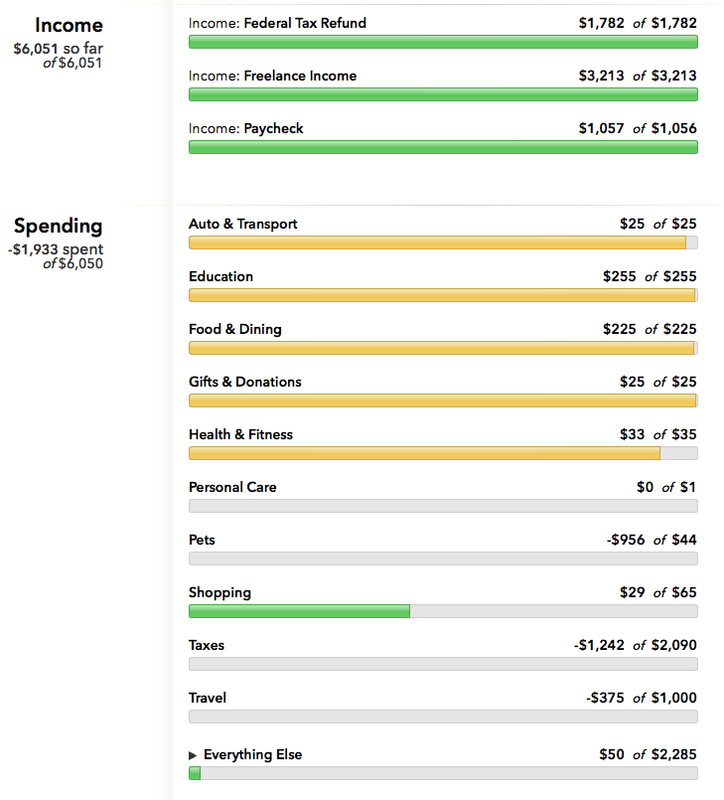 Okay, I know that after looking at January (and February, which I never posted, but the short of it is that I spent $1903—mostly on/in India—and made $2908), this spending seems pretty insane. And it is, but also some of it is explainable. I spent a lot of it in India (a little over $1000), and I had saved up for that, so I feel absolutely no guilt at all, and in fact actually spent about $1000 less than I had planned for. Another $1200 went to an AirBnB for friends in Vermont this summer, and I'll eventually be reimbursed for all but $150 of that. And then a final $1100 or so went to paying my state taxes, which was mostly cancelled out by getting a federal refund, too. So, instead of the $300 that I like to budget for, I still ended up spending around $900. What on? I don't even know, guys. Applying to grad school and taking a math class to improve my application was about $250 of that. I signed up to run one of my favorite races again this year ($35). We visited our parents for Easter and brought a fancy cake from Grand Central ($50). I bought some clothes, new and used ($100). I bought too much food out, of course ($225). I wasn't perfect, but no one ever is. Here's to trying a bit harder in April! More freelance checks came in this month, which was great, of course. I have one more due next week, and then I'm afraid that if I want more money, I'm going to have to get myself some more work. I've enjoyed taking a bit of time off and I'm really waiting to hear back from grad school before I jump into anything else, but I do hope I'll be able to take on a few more projects soon. Much of it went into savings, and my emergency fund is now 95% full. I am hopeful that it will be at 100% for my next report, and I'm really looking forward to that! I'm also a little more than 50% of the way done with my puppy fund, and I put in the $1000 I didn't spend in India right back in a new travel fund. I like to keep about $3000 in there, so there's still a ways to go on it, but 1/3 isn't too bad.